When people say farm-to-table, it isn’t always how I imagine it to be. After all, where else would restaurants be acquiring their ingredients from if not from a farm? But the steps in which it actually arrives to the table is another story in itself. 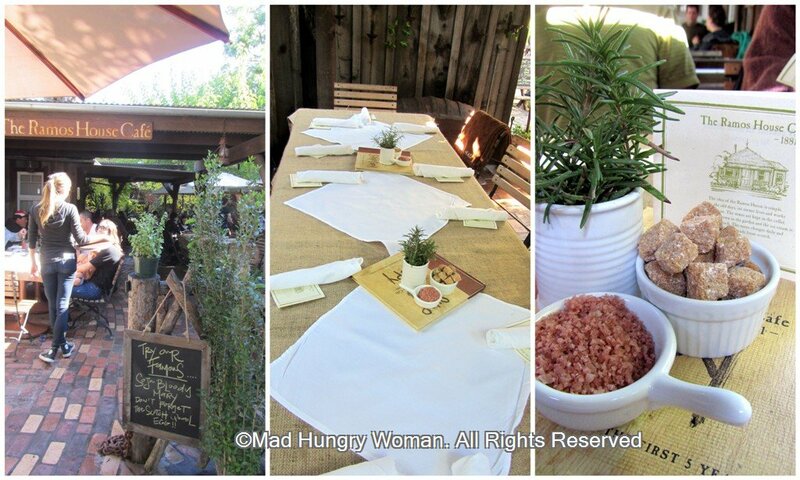 This is why the meal events at The Ecology Center in San Juan Capistrano are so incredibly meaningful because a farm-to-table meal here is really that — from the farm to the table. I recently experienced the Tuscan Brunch of Late Summer Vegetables & Cook Pigs’ Pork ($55) by Chef Ryan Wilson of Five Crowns and SideDoor fame, and his wife Nikki who is currently at Studio at the Montage. We are welcomed by Evan Marks, Founder and Executive Director of The Ecology Center, who gives us background information of the meal we are about to embark upon. Included are the farms from which all the ingredients have been sourced from, mostly, within 100 miles of Orange County. 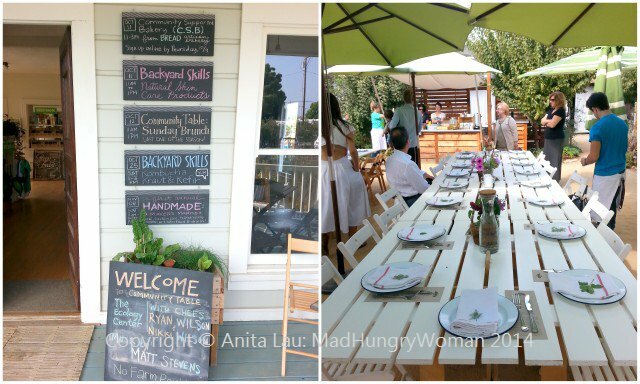 I loved the interactive nature of the brunch. We see Chef Nikki at the earthen oven baking the meal’s starters: Baskets of Lungo Bianco Squash Muffins and Fresh Tigelle which is served with cultured Butter whipped with OC Honey. Our primi course of Ribolita da Delfina of Summer Shelling Beans (photo courtesy of Austin Trask) is a perfect brunch item for everyone since it is vegetarian offering. 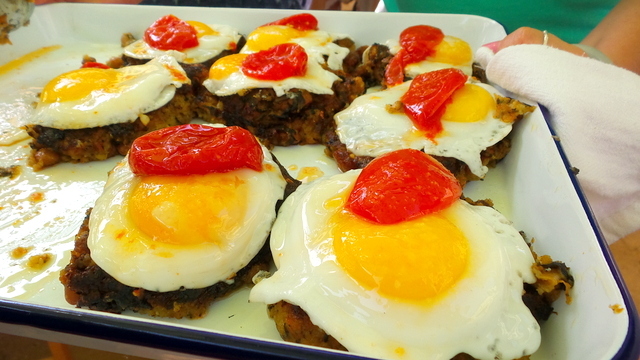 The pattie is dotted with dandelion greens and pumpkin topped with runny fried eggs. The early girl tomatoes conserva brings an element of freshness to this hearty start. 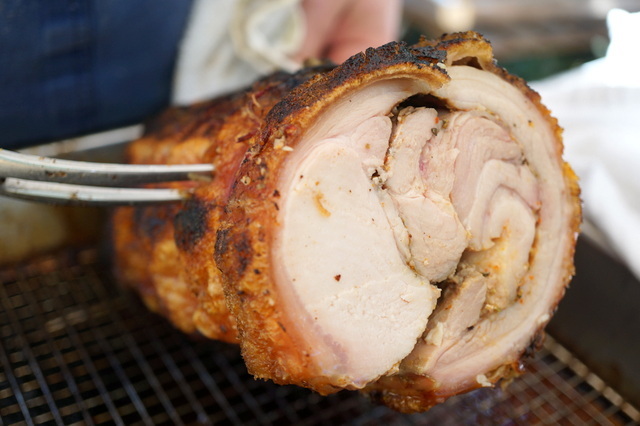 The secondi, or main course of the meal comes in the form of a duo of pork beginning with Porchetta da Panzano, which Chef Ryan has executed to perfection! The skin is crispy, while the meat is moist and well seasoned. 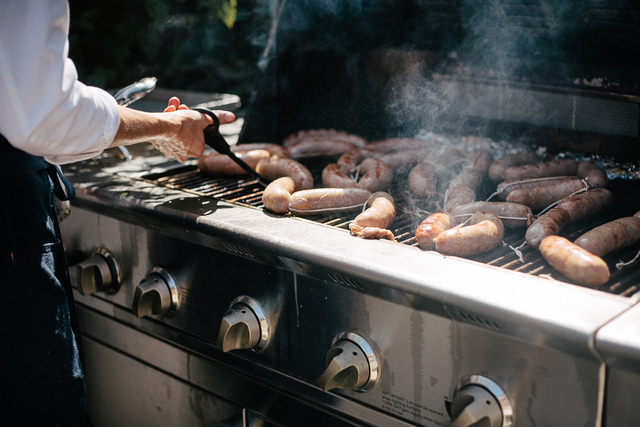 The second pork item was Salsiccia di Maiale (photo courtesy of Aubrey Devin) is a home-made sausage using Heritage pigs from Cook Pigs Ranch located 90 miles away in Julian. Of course, a meal isn’t complete without some sides. 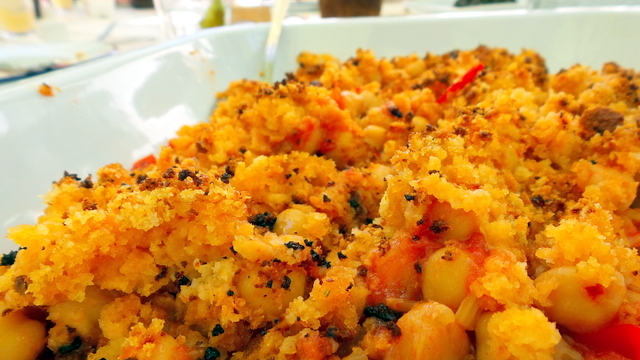 Ceci Beans all’Uccelletto (photo courtesy of Austin Trask) is a chickpea gratin offering the ‘starch’ element of the meal. Braised Greens (photo courtesy of Aubrey Devin) was possibly my favorite of the two sides, nicely wilted and a good complement to the porchetta. 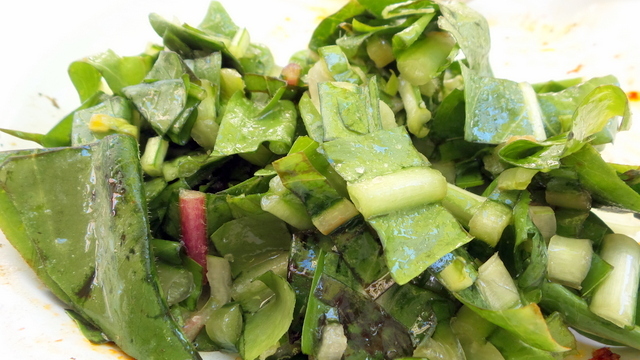 In Italy, they eat salad after the entree, not before, so it was refreshing to see Chef Ryan stay true to the authenticity of the Italian brunch by serving Puntarelle (photo courtesy of Austin Trask) after the entree course. 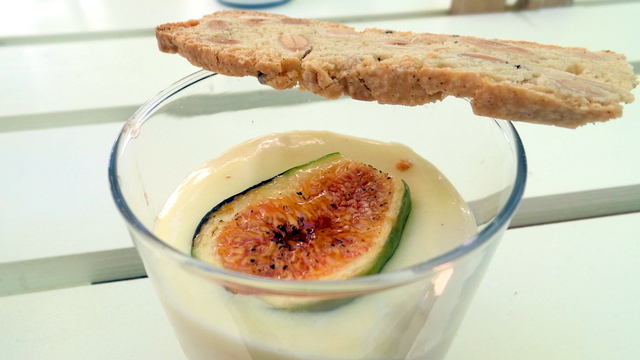 We finished with Chef Nikki’s Marinated Champagne Grapes & Fresh Figs (photo courtesy of Austin Trask) served with a Californian zabaglione accompanied by fennel & almond biscotti. Zabaglione — or sabayon — is one of two desserts I adore so it isn’t surprising that I relished it completely. The use of seasonal grapes and figs creates a refreshing and light end to the meal. The next food-related event at The Ecology Center will be “Fresh Holiday Cooking” on Nov 19th at 6pm. 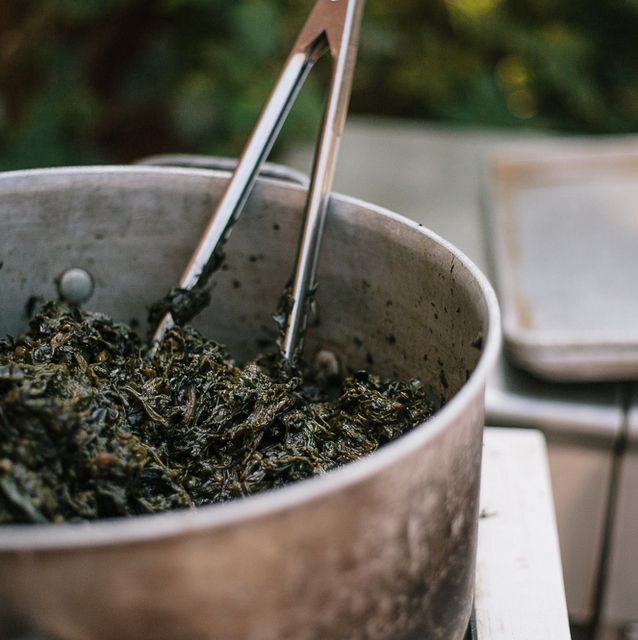 This Farm to Fork adult series of cooking classes emphasizes the journey real food takes from seed to plate—beginning with an exploration of the orchard, vegetable, and herb gardens, and ending with the preparation of a meal. For this event, Chef Linda Elbert will celebrate the holidays and give thanks to the garden! Learn skills, tools & techniques for preparing healthy Thanksgiving side dishes using fresh herbs and vegetables from the garden. On the actual day of my birthday, my friends and I made the trip to San Juan Capistrano and brunched at Ramos House Cafe. It is quite amazing that only two people in my party had been there before and it took us THIS long to finally give it a try. The restaurant is basically a cottage, but you won’t be dining inside. Instead, tables and chairs are set up in the ‘garden’ patio area making you feel like you’re eating in someone’s back yard. It is quaint and extremely charming. Since it was Sunday, a prix fixe menu ($35) is the only option. 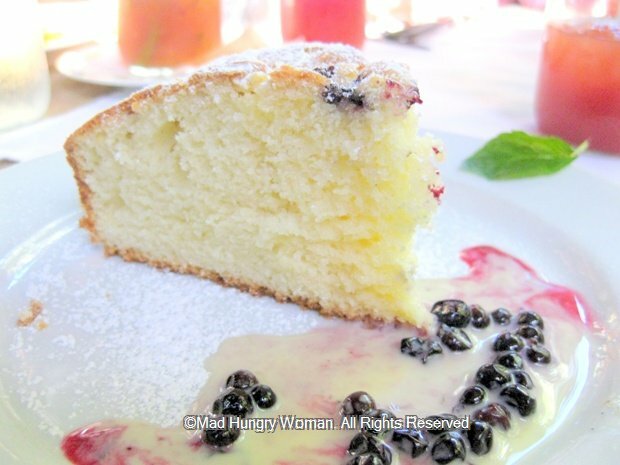 This includes a glass of champagne, mimosa, juice, tea or coffee as well as a starter and an entree. 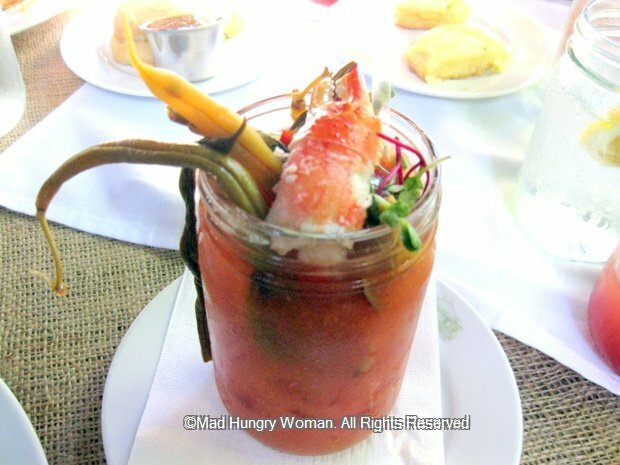 I highly suggest the Bloody Mary ($13) even with its hefty price tag, and is not one of the included drinks. I seriously thought about drinking my brunch instead of consuming it. The cocktail is bloody delicious, complete with pickled green and wax beans plus a crab claw to boot. 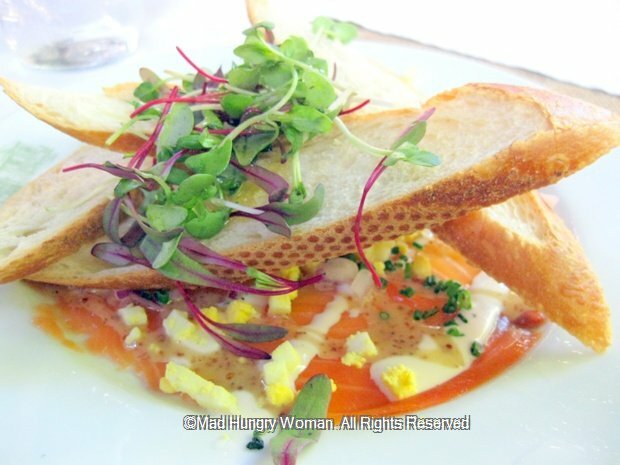 There were six Small Plates to choose from and most of us opted for Basil Cured Salmon Lox which were thinly sliced lox accompanied with chopped boiled eggs, red onions, chives and microgreens. Out of all the small plates I tried, this was my favorite. 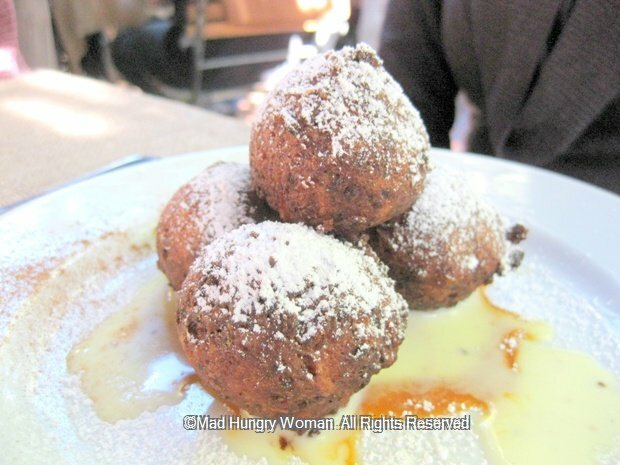 A few chose the Apple Cinnamon Beignets which were stellar as far as beignets go. They weren’t too dense and didn’t taste overly greasy. 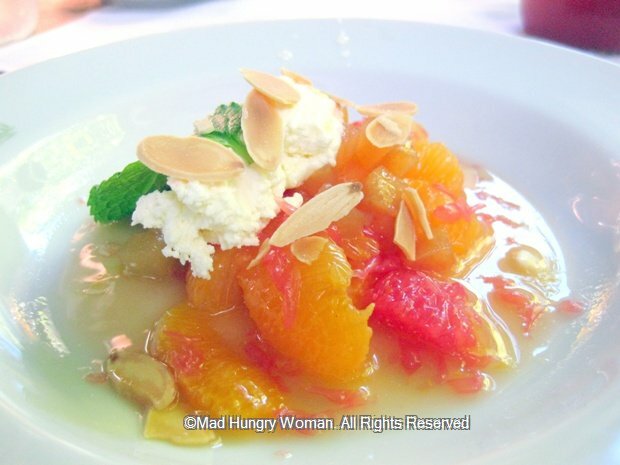 A very healthy individual went for the Citrus w/Toasted Almonds & Farmers Cheese but none of us felt obliged to sample his plate so I can’t comment on it. Fresh Baked Huckleberry Coffee Cake was devoid of any huckleberries in the slice of cake itself although the plate was dotted with a sprinkling of them. The only memorable thing about the cake was how bland it was. 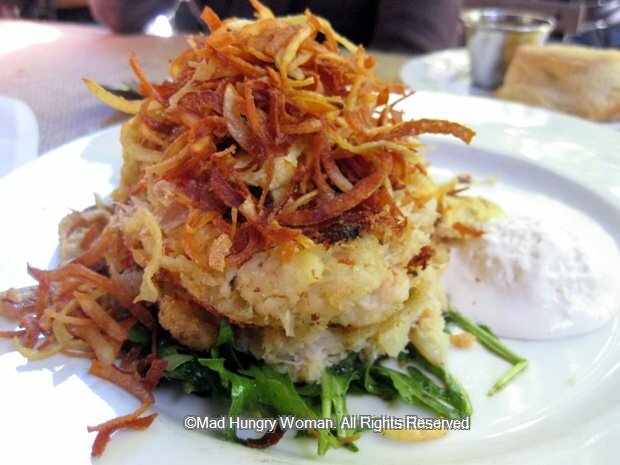 Moving onto the Large Plates, or entree portion of the meal, we found ourselves once again leaning towards the Crab Hash & Bacon Scrambled Eggs & Citrus Cream. Nevertheless, some of us changed our orders to sample a wider variety of dishes. Needless to say it was a good idea at the end of the day because the crab hash was good, but not outstanding. The black board featured a few items and we ordered the Scotch Quail Egg to try. It was well …. 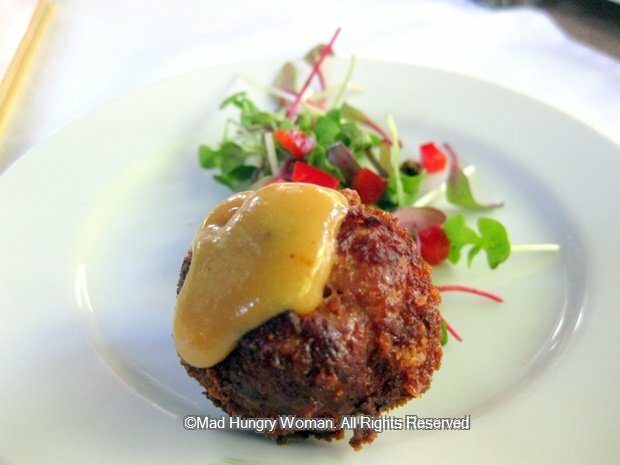 a Scotch quail egg. As far as Scotch eggs go, this was on the decent side — for America — cute but not the best. 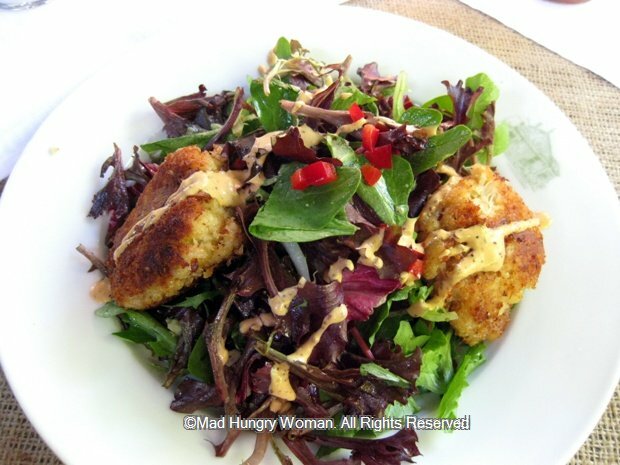 Spicy Crab Cake Salad w/Cranberries & Pumpkin Seed Dressing was disappointing. The crab cakes were very mushy with way too much mashed potatoes as filler and not enough crab to really garner them “crab” cakes. They were more potato cakes with crab really. 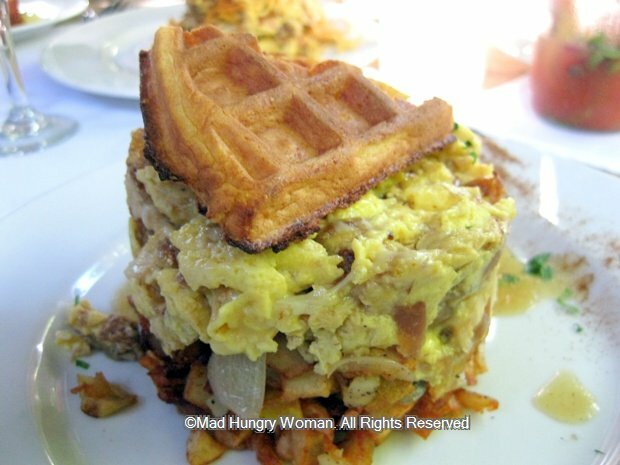 I did enjoy the Fried Chicken Scramble w/Warm Apple Sauce & Waffles, but just the scramble portion. The waffles were sub par and tasted like they had been earlier and warmed up before serving. The chicken scramble itself was very tasty and I actually preferred it over the crab hash. 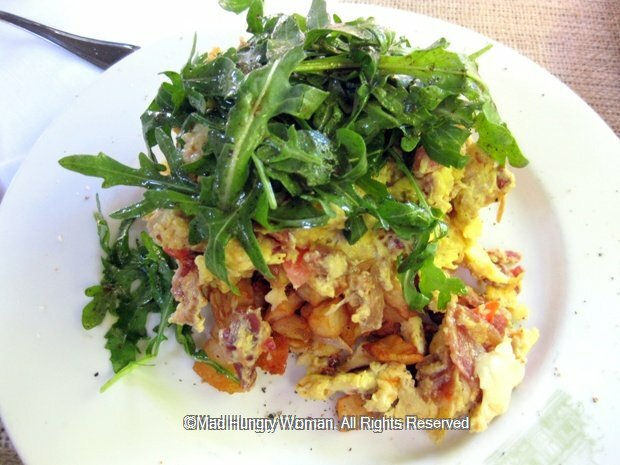 Smoked Bacon Scramble w/Wilted Rocket & Apple Fried Potatoes was my favorite of all the dishes the table ordered. But then again, anything with bacon is a sure win, right? The thin slices of fried apples were a great addition and a unique contrast to the usual fried onions or regular shoestring potatoes. 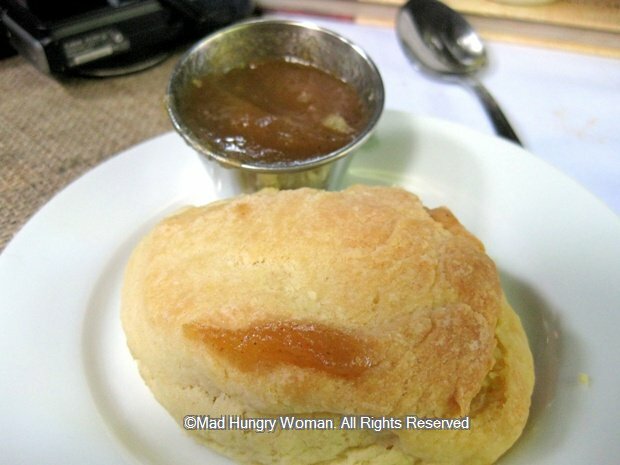 The biscuit which accompanied was the best part of the meal. It was really quite fantastic. I don’t even like biscuits and the one here was fluffy and not the least bit dry. That’s it for the brunch portion. Desserts are an extra $7 each. 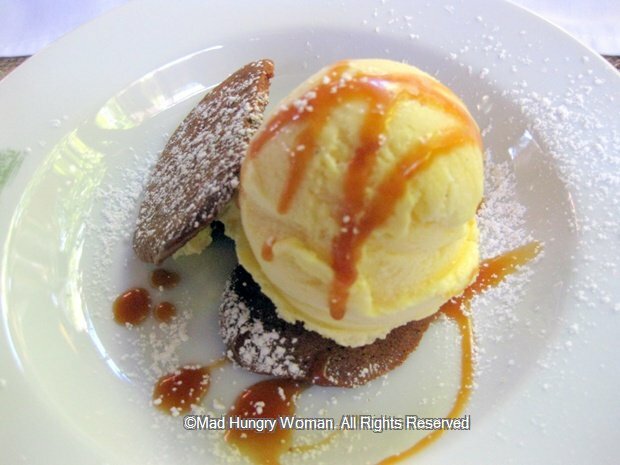 We ordered one dessert, Ice Cream Sandwich of the Day which was ginger cookie with vanilla ice cream. The ice cream sandwich isn’t exactly an ice cream sandwich per se but a deconstructed version of it. It was okay, nothing to write home about. 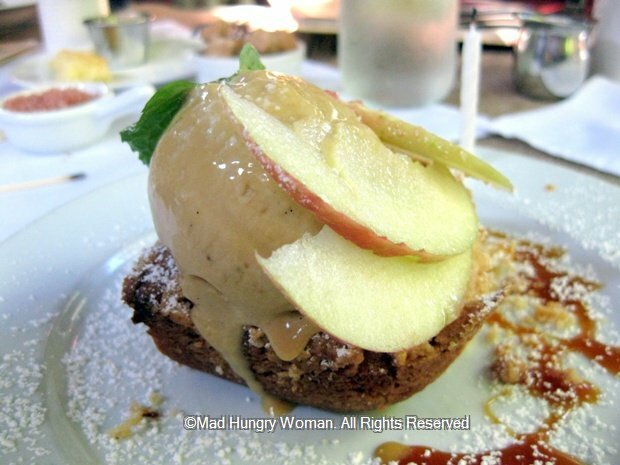 They brought me a dessert for my birthday — Apple Buckle w/Molasses Ice Cream — which frankly was rather nasty. I passed the plate around so everyone could have a taste and the consensus was that the apple buckle was really dry and the ice cream didn’t help much either. Some of us thought it was way too sweet and between the 9 of us, no one wanted a second taste. If that doesn’t tell you something, I don’t know what would. At the end of the day, Ramos House Cafe is a good “special occasion” place. The atmosphere is what I will remember most about our visit. The food did not impress enough for me wanting to pay another visit any time soon. >El Campeon — definitely champions in my book! > We chanced upon El Campeon years ago when we first moved to southern California. We were visiting San Juan Capistrano and saw a huge crowd in and around this restaurant as we drove by. I wasn’t in the mood to tackle the masses so we left, completed what we went to SJC to do and then returned several hours later to see if it was easier to get a parking spot and if the crowd had died down. Unfortunately, it hadn’t and I wasn’t about to leave without giving this place a try. I figured, if a place has this many people hovering around for hours on end, it’s gotta be good, right? So we made our way inside the humble store front — which incidentally has had a slight remodel since our previous visits — where you go through a line, order at the counter, wait for your order to be ready, and then pay at the cashier. Be prepared to be addressed in Spanish, be prepared that they’ll understand you when you speak in English, but that won’t deter them from asking you another question in Spanish. Thank goodness my basic knowledge of Spanish is enough to get my order in, get across the condiments I want, and to understand when my number is being called through the speakers. I’ve returned on various occasions en route to San Diego, usually eating the same thing, but on this particular visit, I decided to try something different. I perused the menu and decided upon the meat I wanted and then made my way up to order. Naturally the lady behind the counter greeted me with an ‘hola‘ and I was ready this time to place my order in Spanish without thinking about it. And like on previous visits, we were asked if the list of condiments were acceptable and whether it was for here or to go. It took about 10 minutes for our order to be ready and just as I’d expected the cashier called out our number in Spanish. Hey, at least this time, it was nine — ‘nueve‘ — and not something like 186! My two tacos — one with al pastor (left) and the other with barbacoa (top right) — were stuffed with meat. 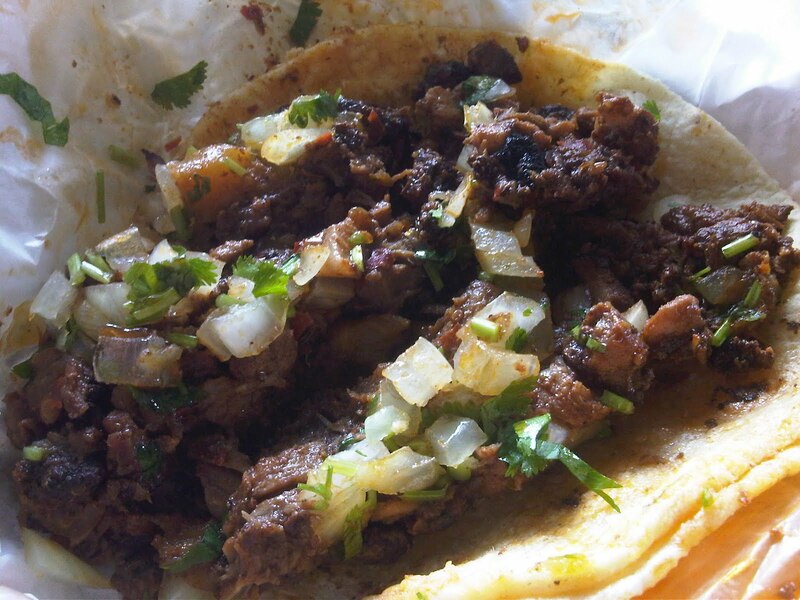 These aren’t your little street tacos. 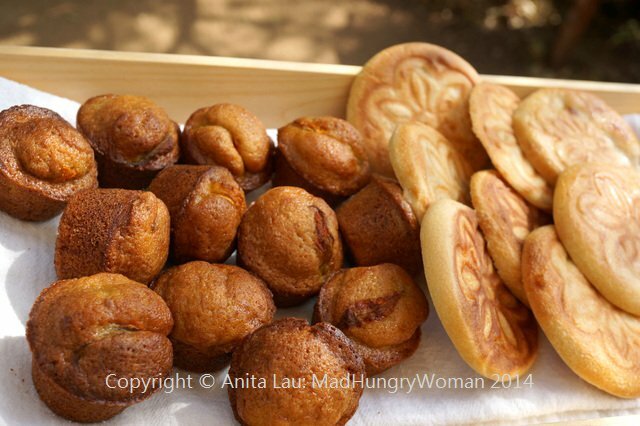 These are larger in size and with the amount of meat on them, it was really filling for me. The al pastor was so flavorful and greasy while the barbacoa was just seasoned perfectly. 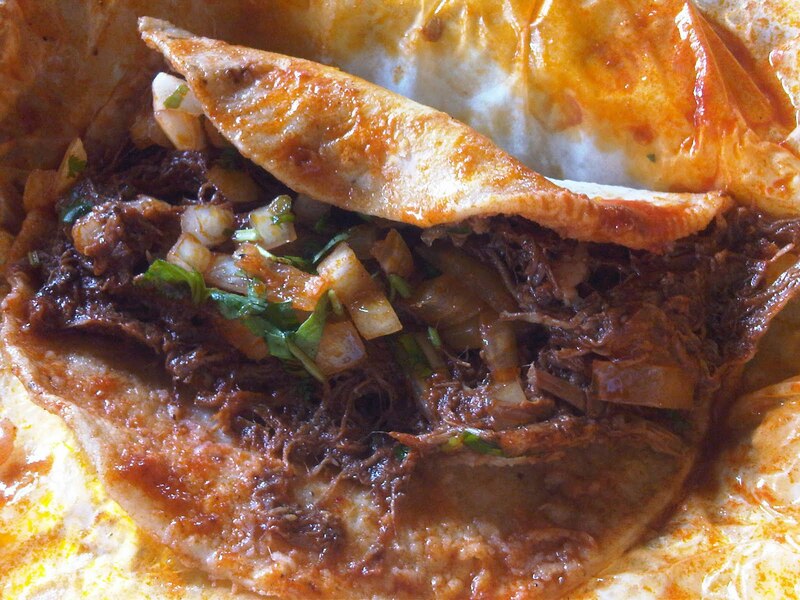 I think I like the barbacoa over the carne asada now — carne asada used to be my meat of choice when I came here. Menudo is served daily and this was what I saw most people order, but I come here for the tacos or the tortas. Agua fresca is freshly juiced here so if you like fresh juices, definitely get one. And if your meal wasn’t enough, the adjoining panaderia will solve that problem! Just grab one or two pan from the display case and your sweet tooth will definitely be satiated! This is one of my favorite Mexican places in Orange County! I only wish it wasn’t such a drive for me but when the craving hits distance is never a real issue!